Clients can avail a fascinating range of quality approved Tube Push Pointer. Manufactured using superior quality raw material procured from the trusted vendors of the market, these products are designed as semi or full automatic sheet cutting. Extensively used in various industries such as Petroleum and Refineries, Oil and Drilling Industry, Piping industries and Chemical industries, these products are also availed to the customers in customized form as per the requirement laid down by the customers. Cut to length lines are manufactured as per customer s requirements. The machine can be designed as semi or full automatic sheet cutting. The length control of sheet cutting is done with help of digital encoder to give max. accuracy in length cutting. AC/DC motors, PLC, electric controls for hydraulic of reputed make are used to control the machine. 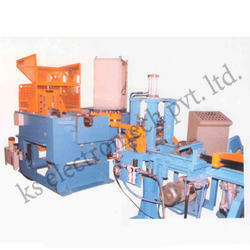 The machine is manufactured by high grade steel & machined for full accuracy. Looking for Tube Push Pointer ?